Providing you the best range of screw conveyor for chemical industry with effective & timely delivery. We have established our self as a renowned firm engaged in manufacturing a wide array of Screw Conveyor for Chemical Industry. Following all the quality guidelines set by the industry, this range is made using qualitative raw-material and latest technologies. 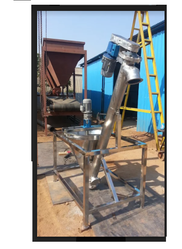 We are the leading manufacturer and supplier of Screw Conveyor for Chemical Industry in Tamilnadu, Kerala, Coimbatore, Tirupur, Karur, Salem, Chennai etc.